" A big passenger jet was right above me. 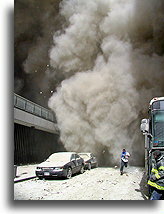 In a blink of an eye, a fraction of a second later an airplane disappeared inside the second WTC tower"
First three galleries above show events that I witnessed in New York City on September 11, 2001. 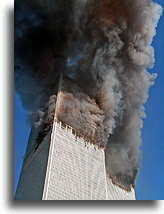 Many pictures were taken around World Trade Center towers, just minutes before collapsing. 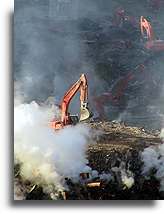 WTC site (part of the financial capital of the world) was called Ground Zero after the collapse of towers. Three galleries above present ruins of World Trade Center complex. First few months after the tragedy. 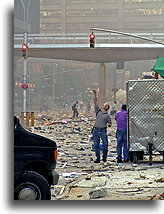 Life and businesses in Ground Zero surrounding area are slowly coming back to normal. 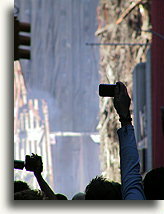 Streets of Lower Manhattan in three galleries: NYC Rising after Attack. 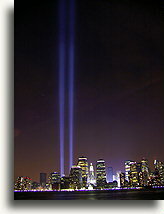 The Tribute in Light marked the six-month anniversary of the terrorist attacks of September 11. The Ground Zero is slowly becoming a construction site of new World Trade Center. 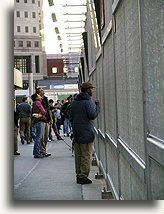 The photo gallery shows WTC in the period before and during construction. 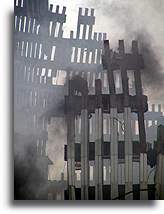 World Trade Center was a complex with characteristic 110-story twin towers. More than 40,000 people worked here every day. 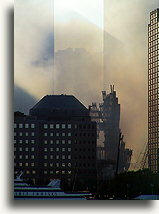 The gallery shows WTC before September 11, 2001. The monument in Washington D.C. commemorates those who died here in the attack on September 11, 2001. 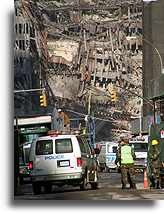 Shortly after two hijacked passenger planes hit both World Trade Center in New York City, a third attack took place at Pentagon. At 9:37, American Airlines Flight 77, a Boeing 757 hit the facade of the Pentagon. It caused a part of the building to collapse. 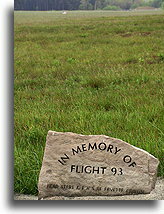 On September 11, 2001 at 8:42 a.m. United Airlines Flight 93 took off from Newark International Airport in New Jersey. Hijacked plane did not reach the target of an attack—probably one of the buildings in Washington, DC—crashing in rural southwest Pennsylvania. Islamic cultural center and mosque in the vicinity of Ground Zero is facing many opponents. The new facility commonly known as Park51 is planned to stand just two blocks from the World Trade Center. 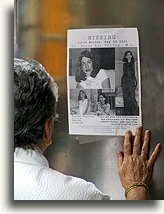 September 11, 2001, 8:46 a.m.
September 11, 2001, 9:03 a.m.
September 11, 2001, 10:29 a.m.